The health benefits of seaweed include relief from cancer, obesity, diabetes, influenza, and radiation poisoning. It helps in improving digestive health, dental health, cardiovascular health, and maintaining healthy skin and hair. It protects eyes and has anti-coagulant properties. It also covers the body’s need for iodine and helps in detoxification. Edible Seaweed is a general nomenclature used for a number of species of algae and marine plants that breed in varied water bodies like rivers and oceans. They grow in a wide range of sizes from minuscule to gigantic. Most of the seaweeds are medium-sized and are available in multiple colors like red, brown, and green. They can be spotted ubiquitously on the seashores or coastlines. Microscopic seaweed like phytoplankton grows hanging in the water. Bigger ones like giant kelp, which is one of the largest plants in the world, grow enormously and stand like an underwater tree with its roots at the foot of the sea. Unlike a weed that grows liberally and can be harmful to the area it dwells in, it plays an extremely vital role in the marine life. It serves as a foundation for the majority of the food chains and provides a home to a number of marine creatures. In addition to this, seaweed possesses anti-microbial and anti-inflammatory properties that have been trusted for providing health benefits to humans from ancient times. Seaweed contains a massive variety of health-promoting components as compared to the majority of other plant and animal-based foods available on land. It is a rich source of essential minerals such as magnesium, calcium, copper, potassium, selenium, zinc, iodine, and iron. It is also very low in fats. It is also a treasure trove of antioxidants, phytonutrients and rich fiber content that is required by the body. 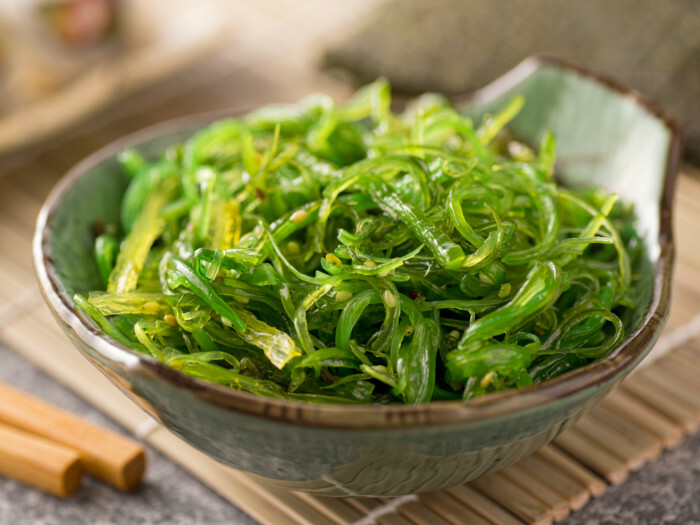 Vitamins present in seaweed are vitamin A, B, C, E, and vitamin K. It also contains omega-3 fatty acids and all the vital amino acids necessary for the body. Seaweed offers many health benefits that have been detailed below. Seaweeds contain cancer-fighting agents that may prove useful in curing tumors and other cancer conditions like colon cancer and leukemia. Brown seaweed such as kelp, wakame, and kombu contain glycoprotein and sulfated polysaccharides called fucoidans that possess immuno-stimulant, anti-viral, and anti-cancer properties. Research studies on the effectiveness of dietary seaweed on breast cancer have shown promising results in reducing the production of cancer-promoting hormones, including estrogen, and have the ability to inhibit the proliferation of malignant cancer cells. Seaweed is a rich source of iodine, which it absorbs in ample amounts from the sea water. Iodine is a vital nutrient required for proper growth for all age groups. It is essential for the normal regulation of thyroid function, which also involves the brain and pituitary gland. The thyroid hormone plays an essential role in the process of myelination of the central nervous system in newborns. A deficiency of iodine in the body can result in abnormalities such as thyroid enlargement or goiter, hypothyroidism, and mental retardation. Iodine is extremely crucial in pregnancy and breastfeeding for the normal development of the brain cells of the baby. Deficiency during these periods or early childhood can lead to weak intellectual growth and abnormal development of the brain. Scientific research has shown that edible seaweed possesses anti-obesity effects. The compound fucoxanthin present in it helps in reducing the accumulation of fats and aids in weight loss. Due to its ability to promote the oxidation of fats, it is used in making prescription diet pills and gastric banding pills. These pills should always be considered after consultation with a medical professional. The fucoxanthin compound present in brown algae has been proven effective in exerting anti-diabetic effects. Along with this, the triglyceride absorption of seaweed Laminaria japonica, also known as kombu, has been praised for its effect on diabetes. As stated by the research, the anti-diabetic effect can be attributed to the presence of alginic acid in the seaweed kombu. Seaweed extracts have long been appreciated for their preventative effect in the growth of dental cavities. The anti-inflammatory properties are responsible for the improvement in the functioning of salivary glands and making the oral tissues more resistant to damage. Alginate, a salt of alginic acid extracted from seaweed, is quite useful in the fabrication of dental molds. Laboratory research has made it evident that seaweed possesses antioxidant and anti-coagulant properties. Anti-coagulants, also known as blood thinners, prevent the formation of blood clots and decrease the threat of stroke, cardiac failure, and obstruction in the veins and arteries. The polysaccharides called fucoidans, which are present in brown algae, such as Turbinaria ornate, kelp, and bladderwrack, exert this beneficial effect. Seaweed possesses the ability to detoxify and cleanse the body and facilitates the excretion of toxic waste. The binding property of the natural absorbent, alginate, which is present in it, makes toxic materials, including heavy metals like lead, mercury, and other pollutants indigestible and eliminates them from the body through bowel movements. Seaweed possesses anti-viral properties that have been proven promising in providing a protective effect against influenza B virus. Its extracts obstruct the absorption of harmful viral particles in the cells and prevent the body from getting infected. Seaweed has been useful in sustaining lower levels of triglycerides and cholesterol in the body. This helps in maintaining a healthy heart, increasing circulation in the blood vessels, and preventing fatal conditions like heart failure, atherosclerosis, and peripheral artery ailments. Seaweed has the ability to protect the skin from damage caused by exposure to ultraviolet B radiation from sunlight. This defensive effect can be attributed to the presence of fucoxanthin in it, which aids in preventing cell damage and enhancing the survival rate of the pre-treated cells. The antioxidant effect of fucoxanthin protects the skin from photo-aging, pigmentation, and wrinkle formation, while also making it an effective component to be used in the cosmetic industry for the manufacturing of sunscreens. Various research studies conducted to investigate the radioprotective effect of seaweed extracts against the exposure to gamma radiations have shown positive results. The anti-ocular inflammatory effect exerted by fucoxanthin, present in seaweed, has shown promising results in the prevention of after-cataract. This complication is also known as posterior capsule opacification, which can occur after cataract surgery. Fucoxanthin is utilized in the formulation of products used in ocular implants in the cataract surgery to avoid the risk of after-cataract. The wealth of essential vitamins, minerals, amino acids, and antioxidants in seaweed helps in keeping the skin revitalized, moisturized, and youthful. These elements guard the skin against the harmful effects of environmental pollutants and help slow down the skin’s aging process. Scientific research has made it evident that seaweed extracts contain anti-aging properties and are a useful ingredient in the manufacturing of skin care cosmetics. The anti-inflammatory properties present in seaweed are useful in treating skin rashes and wounds. The phytonutrients elevate blood flow and bring a healthy glow to the face. Seaweed wraps detoxify and cleanse the skin by expelling toxins out of the pores. Seaweed baths have also been admired among British and Irish for ages due to their therapeutic effects. The high mineral content of seaweed also aids in maintaining healthy hair. Minerals help in strengthening the roots and shafts of hair follicles and make them thick and lustrous. Due to this beneficial effect, seaweed has been proven valuable in the manufacturing of shampoos and hair creams. Seaweed helps in maintaining the electrolyte balance of the body. The anti-inflammatory effect has proven effective in the treatment of osteoporosis and rheumatoid arthritis as well. They possess healing properties that aid in enriched blood circulation and a robust immune system.